There are places in this world endued with magic. Some are imposing edifices, others are hardly trodden hinterland, but of the most magical to me are those places deeply woven in the fabric of any given culture. It is for that reason that I so love, collect, and preserve through photographs Americana, the magic idols of my culture. The enchantment in Americana is a link to that simpler time of which our grandparents speak, of that chimera dream we chased once in this country. Some of those magical ghosts of the American dream are abandoned and fading, while others are still alive and thriving. Among those still alive, albeit perhaps not in all cases thriving, are drive in movie theaters. 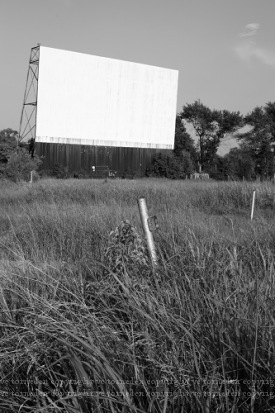 Close to my heart are drive ins, not only for my fixation with automobiles and Americana, but also because some of my fondest memories from childhood into adulthood involve trips to the drive in. 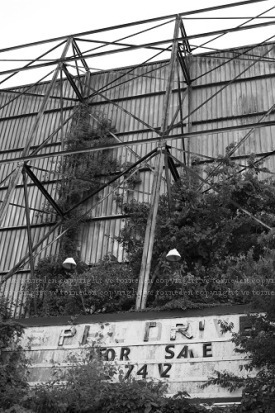 An unabashedly American institution leftover from the heyday of the automotive industry and golden era of Hollywood, at their height of popularity drive ins compromised a quarter of the nation’s theaters but as technology rolled on, most were abandoned and demolished, with a scant few hanging on into the modern day primarily thanks to nostalgia. Although Oklahoma was a latecomer to the drive in boom, much to my jubilation it has also been tardy to follow the decline of the drive in theater, with at least eight of its theaters still in constant operation, a ninth in partial operation and a tenth under new ownership with the possibility of reopening. 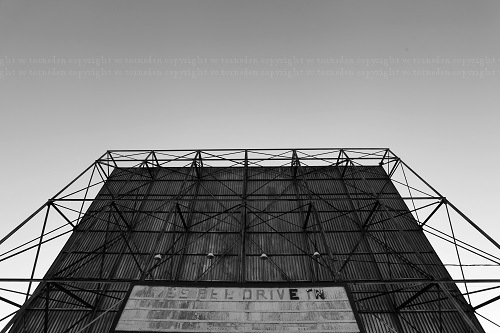 Inspired by this abundance and multiple recent trips to the drive ins of our area, I am starting a short series of entries within which a selection of the remaining drive ins of Oklahoma and surrounding states will be featured, both those which are open and those abandoned. It is my hope that a new audience will be touched by the magic of these bygones, find the beauty even in the abandoned theaters to be posted here, and see fit to support either one of those still open theaters featured on this blog or seek out one left in your own area which would no doubt be very much grateful for your support. The photographs seen in this entry are a selection from a series taken in 2011 and 2012, some previously published both on this blog and elsewhere. They are of the tenth Oklahoma drive in mentioned above, the Teepee Drive In in Sapulpa originally opened in 1950. 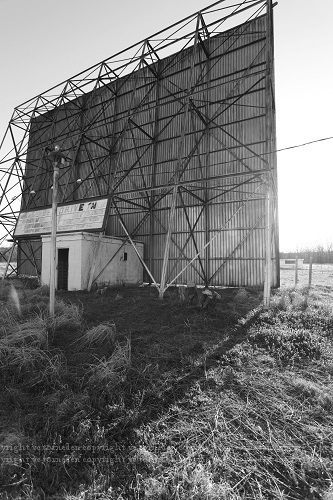 Due to its potential for reopening and because of its 66 location, I am choosing to make it the first of the abandoned drive ins to be featured here. One of the remaining Route 66 drive ins in Oklahoma, the Teepee has been abandoned since 1999, but a couple of years ago it was purchased by a new owner with plans to reopen, revitalize and even bring back the original teepee neon sign that once graced Route 66. At that time I raced to take these photos the day before the lot was due to be cleaned and cleared with the intent of documenting the drive in both its abandoned state and after its revitalization. I also took photos when locals voluntarily cleaned the lot. However, with the closure of the bridge leading to the drive in due to structural issues, allegations swarming about the purchaser of the property, and for other reasons unknown, the Teepee currently remains abandoned. 22 Jul	This entry was published on July 22, 2014 at 16:30. It’s filed under Oklahoma, Other, Roadside Photography, Route 66 and tagged 1950s, Abandoned, Americana, Automotive, Destinations, Drive In Theater, History, Movies, Nostalgia, OK, Oklahoma, Route 66, Sapulpa, Teepee Drive In, The Mother Road. Bookmark the permalink. Follow any comments here with the RSS feed for this post.